One of the best ways to look carefully at narrative, particular in paintings, is using diagrams, and one of the best tools for diagramming to work with narrative is Storyspace 3 (Tinderbox devotees will no doubt be able to do everything here using that, if they prefer). If you have not come across Storyspace before, I have a lot of articles which explain its origins and use, conveniently accessed through this index. You can download a free demo version for the Mac which you can use to explore these documents, from Eastgate’s site. 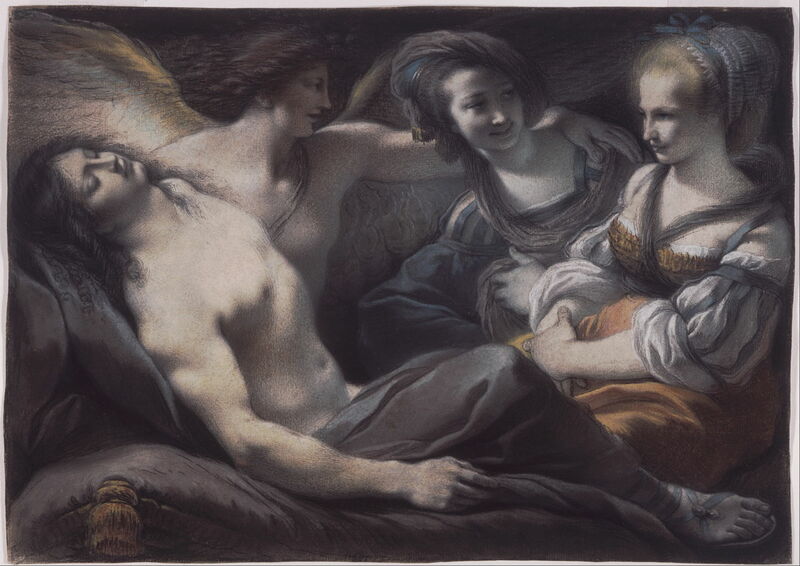 In this article, I am going to show how Storyspace can be used to analyse the narrative elements in two of the paintings of the Rinaldo and Armida story, which I have shown for Poussin here, and for Cades and others here. Although there are much better modern translations, I will use a copyright-free version freely available from OMACL for this analysis, so that I can distribute it with my example files. My first step is to copy out the relevant sections of the text narrative, into a series of linked writing spaces in Storyspace. Because this is a standard linear narrative, the writing spaces can be linked in a straight chain. I divided the sections up into sub-stories, each of which goes into its own writing space, and I have placed them in Storyspace’s Map view so that Armida’s actions line up down the left, and Rinaldo’s on the right. The final writing space involves Rinaldo’s colleagues, Carlo (Charles) and Ubaldo, and I have therefore put that in the middle. Here is the Map view of that completed Storyspace document, showing the narrative structure. The link to download all the documents for this article is at the end. You can read the narrative in sequence by selecting the first writing space Armida’s nature and hunt, then with the view set to Read rather than Edit, press Return to follow the links through the poem. Concentrating on the narrative elements within it, I have discussed five key passages: the amorino (cherub-like creature), its restraint on Armida’s right arm, which holds a dagger, whilst her left arm is caressing Rinaldo’s right hand, on his head, and Armida’s facial expression. There are of course several passages which are key to identifying Rinaldo and Armida, such as his armour and its helmet placed conspicuously at the right of the painting, and the fact that he is shown asleep, having been enchanted by Armida. In my diagram of the narrative elements, I have added detail views of the relevant passages in the painting, and coded the writing spaces by colour: green indicating the romantic elements, dark red the murderous one, and blue the expressions of conflict. I have also used a flag for the writing space of the amorino to signify that it is a symbolic rather than literal element. These all come together in the conflict which is shown in Armida’s facial expression. The links shown represent dependencies, thus narrative links, although you can of course traverse them in the usual way. The overall picture is of a painting which is tightly bound to the narrative text, and its central conflict between the desires for romance and murder. This is a powerful narrative. Cades does not use the painting to establish the conflict in Armida’s mind, as Poussin did. This may be a result of the gradual decline from favour of the traditional historia, history painting, or because the artist intended a different narrative which is now obscure. I leave that for you to speculate. There are many different tools for creating diagrams like these, but none is so well-equipped for analysing narrative as Storyspace (or Tinderbox, if you prefer). Not only that, but you can then develop your analyses into a proper hypertext account of Tasso’s poem, and its expressions in paint. Posted in General, Language, Macs, Painting, Technology and tagged Armida, Cades, Eastgate, hypermedia, hypertext, Jerusalem, narrative, painting, Poussin, Rinaldo, Storyspace, Tasso. Bookmark the permalink.